NEED AN EXCUSE TO GO TO PARIS? 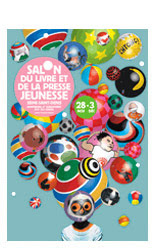 The 23rd Salon du livre et de la presse jeunesse en Seine-Saint-Denis (Young People's Book and Press Show) will be held from 28 November to 3 December 2007, attended by authors, illustrators, publishers and professionals of children's literature. This year the emphasis is on English literature (' la littérature anglo-saxonne'). sounds fabulous... I think! Sadly the whole site is in French and my schoolgirl variety just isn't up to it! Neither is my schoolboy French, I should have paid more attention to Mr.Cook at Gisborne Boys High School! Never mind, the whole idea is most appealing and if any of us got there I'm sure we could bluff our way with that limited French vocab we possess! I'm not bad in cafes!